Nicholas Berkeley Mason, CBE (born 27 January 1944) is an English drummer, best known as a founder member of the progressive rock band Pink Floyd. Mason is the only Pink Floyd member to have been featured on all of their studio albums, and the only constant member of the band since its formation in 1965. It is estimated that as of 2010, the group have sold over 250 million records worldwide, including 75 million units sold in the United States. Despite solely writing only a few Pink Floyd songs, Mason has co-written some of Pink Floyd's most popular compositions such as "Echoes" and "Time". He collects classic cars and drives competitively. 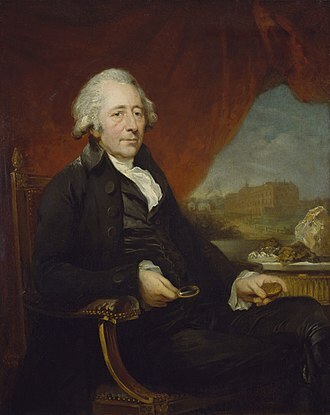 The son of documentary film maker Bill Mason, he was born in Birmingham but brought up in Hampstead, London (many online biographies mistakenly cite the street address Downshire Hill, sometimes as "the Downshire Hills", as a district of Birmingham), attending the Hall School, Hampstead, and afterwards studying at Frensham Heights School, near Farnham, Surrey. He later studied at the Regent Street Polytechnic (now the University of Westminster), where he teamed up with Roger Waters, Bob Klose and Richard Wright in 1964 to form Pink Floyd's predecessor, Sigma 6. Mason has been the drummer on every Pink Floyd album. 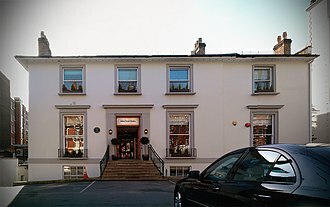 The only Pink Floyd songs whose composition is credited solely to Mason are "The Grand Vizier's Garden Party Parts 1–3" (from Ummagumma) and "Speak to Me" (from The Dark Side of the Moon). The one-off song by the band titled "Nick's Boogie" was named after him. The only times Mason's voice has been included on Pink Floyd's albums are "Corporal Clegg", the single spoken line in "One of These Days" and spoken parts of "Signs of Life" and "Learning to Fly" (the latter taken from an actual recording of Mason's first solo flight) from A Momentary Lapse of Reason. He does, however, sing lead vocals on two unreleased but heavily bootlegged tracks, "Scream Thy Last Scream" (1967), penned by original leader Syd Barrett and "The Merry Xmas Song" (1975–76). In live performances of the song "Sheep", he did the spoken section. Despite legal conflicts over ownership of the name 'Pink Floyd', which began when Waters left the group in 1985 and lasted roughly seven years, Waters and Nick Mason are as of 2010 on good terms. Mason joined Waters on the last two nights of his 2002 world tour to play drums on the Pink Floyd song "Set the Controls for the Heart of the Sun", and he also played drums on some concerts of Waters' European tour in 2006, and during performances in Los Angeles and New York City in the United States. In July 2005, Mason, Gilmour, Wright, and Waters played together on stage for the first time in 24 years. 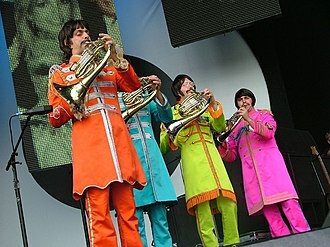 A four-song set was played at the Live 8 concert in London. Mason also joined Gilmour and Wright for the encore during Gilmour's show at the Royal Albert Hall, London, on 31 May 2006, reuniting the post-Waters Pink Floyd. Mason has claimed to be the link between Gilmour and Waters, and believes[when?] the band will play live again, mentioning the possibility of "playing again for a charitable cause" or even "a tour" in various interviews in the last few years. 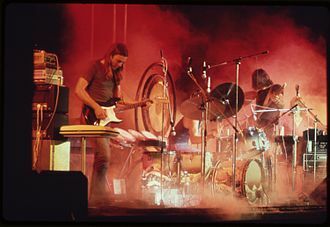 He also stated in 2006 that Pink Floyd had not officially disbanded yet, but with the death of Wright in 2008, the band effectively came to an end as confirmed by Gilmour. In spite of this, Mason has continued to join Waters onstage on occasion. On 12 May 2007, Mason joined Waters again on stage at Earls Court to play The Dark Side of the Moon. Again, on 12 May 2011, Mason was featured (along with David Gilmour) on the encore "Outside the Wall" at a concert by Waters, who was performing The Wall in its entirety (Gilmour also performed on "Comfortably Numb" that night). 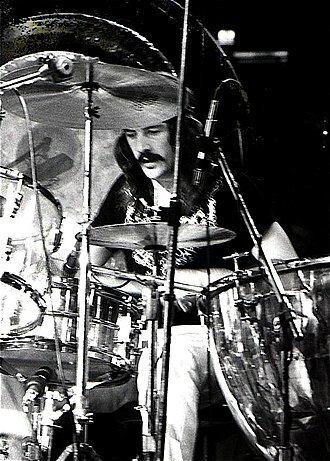 Unlike the other members of Pink Floyd, Mason has rarely played an instrument other than his drum kit or large array of percussion instruments, although he has utilised tapes and contributed sound effects to many Pink Floyd albums. He has only played non-percussive instruments on "The Grand Vizier's Garden Party", his personal composition from Ummagumma, where he used a mellotron to play brief melodies and create ambient noises, on "Jugband Blues", where he played kazoo, and on live versions of "Outside the Wall", where he played acoustic guitar along with the rest of the band. However, on the Profiles album Mason released with Rick Fenn in 1985, he is also credited with keyboards. He can be seen playing a vibraphone in the promo video for "Lie for a Lie", but it is unknown if he actually played on the recording. Mason has also said that he took some failed piano and violin lessons as a child before taking up drums. Mason has occasionally worked with other musicians, notably as a drummer and producer for Steve Hillage, Robert Wyatt (with whom he appeared on Top of the Pops), the Damned and Gong. He also drummed for Michael Mantler. Mason's book, Inside Out: A Personal History of Pink Floyd, was published in the UK in October 2004. It is also available, abridged, as a 3-CD audio book, read by Mason. 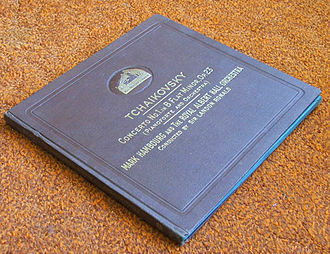 An updated edition was published, in paperback, in 2011. He performed in the closing ceremony of the 2012 Olympic Games on 12 August 2012. He produced and played on the charity single "Save the Children (Look Into Your Heart)", which also featured Beverley Knight, Mick Jagger and Ronnie Wood and which was released in May 2015 in aid of Save the Children's Nepal Earthquake Appeal. On 17 October 2012 Mason was presented with a BASCA Gold Badge Award in recognition of his unique contribution to music. On 17 April 2018 Mason announced his new band, Nick Mason's Saucerful of Secrets. The new five-piece band will be performing four shows in London in May 2018. The band includes long-time Pink Floyd and David Gilmour bass player Guy Pratt; Blockheads guitarist Lee Harris; Spandau Ballet's Gary Kemp on guitar and vocals; and producer/composer Dom Beken on keyboards. The band will focus on performing tracks from Pink Floyd's embryonic years of 1967-1972. Influenced by jazz and big band music, Mason embraced acoustic drums (both single and double headed), tuned percussion, electronic drums and Rototoms, melding all of these into a melodic whole. His snare drum sound shifted from harsh demarcation of beats 2 and 4 ("Careful with that Axe, Eugene") to a fatter and gentler timbre ("Echoes") — a change that reflected growing studio skills. His style was gentler and more laid back than that of other progressive rock drummers of the time. 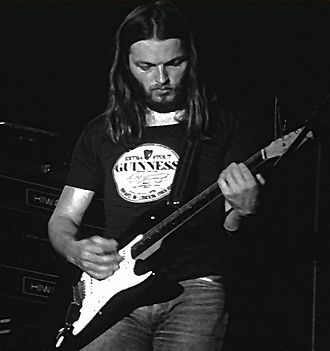 Mason soloed on a few Pink Floyd compositions including "Nick's Boogie", "A Saucerful of Secrets", "The Grand Vizier's Garden Party", "Up The Khyber", "Skins", and "Time". Due to the dynamic live performances of Pink Floyd, Mason's style was more energetic and complex live, and can be heard on such albums as Ummagumma and Live at Pompeii. He used Premier drums in the 1960s and occasionally in the 1970s[according to whom?]. After that, he used Ludwig drums from 1970 until 1992. He currently uses Drum Workshop (DW) drums, pedals and hardware. His kit is a DW double bass kit with the Dark Side of the Moon logo on the drums. He has also used Paiste cymbals during his entire career with Pink Floyd and currently uses a mixture of Paiste Traditional, Signature and 2002 cymbals. He also endorses Remo drumheads, Latin Percussion and Pro-Mark sticks. As Pink Floyd's recording and touring schedule grew more sporadic, Mason was left with more time to pursue his favourite hobby: motor racing. This interest was documented in the 1986 short film Life Could Be a Dream. He owns (through his company Ten Tenths) and races several classic cars, and has competed successfully at the 24 Hours of Le Mans. His racing cars include: Alfa Romeo 8C; Bentley 4½ Litre (his father's racing car); Bugatti Type 35; Jaguar D-Type; Ferrari 250 LM; Ferrari BB LM; Maserati Tipo 61; McLaren F1 GTR; and he previously raced a BRM P30. His car collection has been a subject of his 1998 book, Into the Red, in which he documents his experience with his cars, along with some histories. Mason is mostly associated with Italian-manufacturer Ferrari, and estimates he has owned 40. His first purchase in the early 1970s was a Ferrari 275 GTB/4, which he comments would regularly wet-plug. His most notable purchase was in 1977 from his proceeds from the sale of the Pink Floyd album Dark Side Of The Moon, when he paid £37,000 for one of the 39 built Ferrari 250 GTO cars - he still owns the car, valued now in excess of £30M. Mason and Pink Floyd guitarist Dave Gilmour drove the first two Ferrari F40's back to the UK from Maranello. Mason was invited by Ferrari to purchase one of the 400 Enzo models (now sold replaced by a Blu Scozia-coloured LaFerrari), which he let Jeremy Clarkson borrow for reviewing purposes on the BBC motoring programme Top Gear. Mason agreed, on the sole condition that throughout the review, Clarkson promoted the release of the book Inside Out: A Personal History of Pink Floyd. This led to Clarkson using Pink Floyd album titles in his description of the Enzo and The Stig driving round the track with "Another Brick in the Wall"[clarification needed] playing (despite the fact that the Enzo does not come equipped with a stereo). Mason appeared on Season 2, Episode 8 of The Grand Tour. He competed and won against Stewart Copeland for the title of "fastest rock drummer from a band that begins with a P" in the show's Celebrity Face Off segment. Mason's first marriage was to Lindy Rutter, with whom he had two daughters Chloe and Holly. Lindy was an accomplished woodwind player; she played flute on "The Grand Vizier's Garden Party" from Ummagumma. The couple divorced in the late 1980s and Mason is now married to his second wife Annette Lynton (Nettie), an actress also known for her adjudication role on the second series of Treasure Hunt in 1984. They have two sons Cary and Guy and live in Hampstead, London. Since 1995 they have also owned Middlewick House, the Grade II listed former home of Andrew and Camilla Parker Bowles, in the Wiltshire town of Corsham. Holly is married to sports car racer Marino Franchitti, the younger brother of multiple IndyCar champion Dario Franchitti. His wealth amounted to £75 million, according to the Sunday Times Rich List 2015-2016. Mason is a qualified pilot, and flies an Aerospatiale AS 350 Squirrel helicopter in specially painted colours. 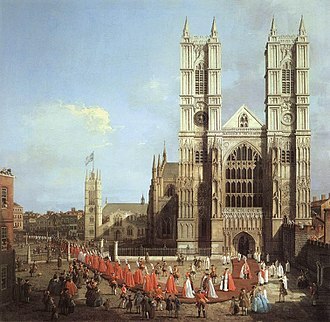 On 26 November 2012, Mason received the Honorary title of Doctor of Letters from the University of Westminster at the presentation ceremony of the School of Architecture and Built Environment (he had studied architecture at the University's predecessor, Regent Street Polytechnic, 1962–1967). 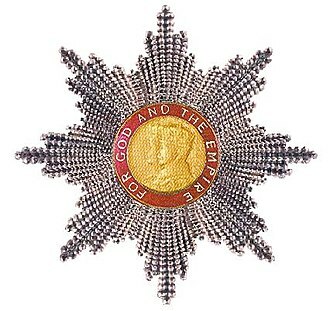 Mason was appointed a Commander of the Order of the British Empire (CBE) in the 2019 New Year Honours, "for services to music". In common with Roger Waters, Mason has played concerts to raise funds for the Countryside Alliance, a group which campaigned against the ban on fox hunting with the Hunting Act 2004. In 2007 they both performed at Highclere Castle in Hampshire in support of the group. He is a board member and co-chairman of the Featured Artists' Coalition. As a spokesman for the organisation, Mason has voiced his support for musicians' rights and offered advice to younger artists in a rapidly changing music industry. 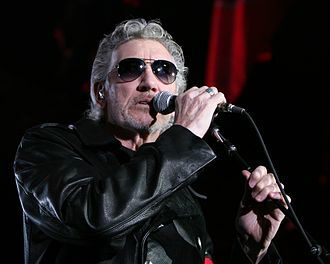 Mason has joined Roger Waters in expressing support for the Boycott, Divestment and Sanctions campaign against Israel over the Israeli–Palestinian conflict and urged the Rolling Stones not to play in Israel in 2014. Screw – Banks of the River / Devil's Hour (1969), a 10" single, rel. on Shagrat Recs. Steve Hillage – Green (1978); co-produced w/ Steve Hillage. Mason also plays a drum on "Leylines to Glassdom"
2008 : Robert Wyatt & Friends - Theatre Royal Drury Lane 8th September 1974 - With Hugh Hopper, Mike Oldfield, Dave Stewart, Fred Frith, Julie Tippetts, Ivor Cutler, etc. ^ a b c d e f g h i j k l m n o Mabbett, Andy (2010). Pink Floyd – The Music and the Mystery. London: Omnibus. ISBN 978-1-84938-370-7. ^ "Pink Floyd are 'done', says Dave Gilmour". The Guardian. 14 August 2015. Retrieved 19 August 2015. ^ a b c d e f g h i j k l Miles, Barry; Mabbett, Andy (1994). Pink Floyd the visual documentary (Updated ed.). London :: Omnibus. ISBN 0-7119-4109-2. ^ "Beverley Knight, Mick Jagger & Ronnie Wood Charity Single". Save the Children UK. Archived from the original on 23 November 2015. Retrieved 23 November 2015. ^ "Gold Badge Awards 2012 in pictures - M Magazine". 23 October 2012. ^ Colothan, Scott (17 April 2018). "Nick Mason to perform early Pink Floyd with new band Saucerful Of Secrets". Planet Rock. Retrieved 17 April 2018. ^ Hunt, El (17 April 2018). "Nick Mason's Saucerful Of Secrets also features members of Spandau Ballet and The Blockheads". NME. Retrieved 17 April 2018. ^ "Artists". Lpmusic.com. Archived from the original on 2009-05-09. ^ Fitch, Vernon (8 May 2000). "Life Could Be a Dream – The Nick Mason film". pinkfloydarchives.com. Retrieved 31 January 2017. ^ Discovery Channel Documentary, "World's Most Expensive Cars"
^ a b c d carwitter. "A Visit To Nick Mason's (Pink Floyd) Car Collection". ^ a b c d "Gallery: inside Nick Mason's toybox". 4 May 2012. ^ a b Frank, Knight. "Classic car investment special: Pink Floyd drummer Nick Mason on why he loves his Ferrari 250 GTO". www.knightfrank.co.uk. ^ a b c d "Me and My Motor: Nick Mason of Pink Floyd recalls a "stupid" car investment with a £30m return". Driving.co.uk. Retrieved 2018-09-21. ^ "Into the Red". Tentenths.co.uk. Archived from the original on 6 October 2011. Retrieved 22 October 2011. ^ "Ferrari Enzo - Ex Nick Mason for sale at Talacrest". talacrest.com. ^ "Nick Mason's blue LaFerrari is like the dark side of the moon". ^ Ivie, Dave (11 December 2017). "The Grand Tour Season 2 Goes Back to Its Top Gear Roots". Retrieved 13 December 2017. a future episode [...] will see Nick Mason and Stewart Copeland competing for the title of fastest rock drummer. ^ Boshoff, Alison (3 December 2011). "Pink Floyd family values: It's not just rioter Charlie Gilmour... how four rock stars had EIGHTEEN children by eight women". Mail Online. London. Retrieved 20 December 2011. ^ "Stock photography image of Mason of in his special painted Aerospatiale AS 350 helicopter". Photographersdirect.com. Retrieved 22 October 2011. ^ "No. 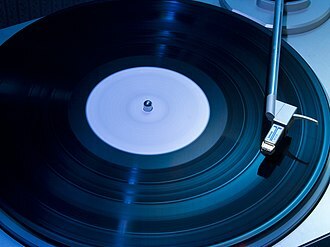 62507". The London Gazette (1st supplement). 29 December 2018. p. N9. ^ Melia, Daniel (14 March 2006). "Pink Floyd Legends To Play Gig For Pro-Hunt Campaigners". Gigwise. Retrieved 15 August 2015. ^ Povey, Glenn (2008). Echoes: The Complete History of Pink Floyd. Mind Head Publishing Ltd. ISBN 978-0955462412. ^ Youngs, Ian (16 October 2010). "Pink Floyd may get back together for charity". BBC Online. Retrieved 16 October 2010. ^ Youngs, Ian (18 October 2010). "Pink Floyd drummer Nick Mason gives advice to new bands". BBC Online. Retrieved 15 August 2015. ^ "Pink Floyd's Roger Waters and Nick Mason: Why Rolling Stones shouldn't play in Israel". Salon. 1 May 2014. Retrieved 15 August 2015. ^ "Q magazine Questionnaire". Archived from the original on 27 May 2011. Retrieved 13 May 2011. Edgbaston is a suburban area of Central Birmingham, England. It is curved around the southwest of the city centre and it is bordered by Moseley to the south east and by Smethwick and Winson Green to the north west. Edgbaston is home to the University of Birmingham, established as Birmingham Medical School in 1825, Edgbaston traditionally has a reputation for being one of the most upmarket and affluent parts of Birmingham or where the trees begin. 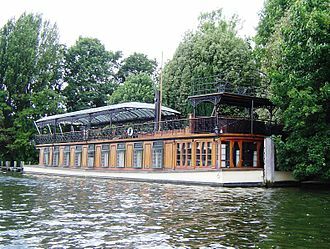 The parliamentary constituency of Edgbaston includes the smaller Edgbaston ward and the wards of Bartley Green, Edgbaston is a local government district, managed by its own district committee. Edgbaston means village of a man called Ecgbald, from the Old English personal name + tun farm, the personal name Ecgbald means bold sword. In 1801, Edgbaston had a population of around 1,000 people, by 1841, this had increased to 16,500 as a result of wealthy manufacturers moving to the area. By 1850,29 roads had been out and uninterrupted growth continued. The United Kingdom Census 2001 found that 20,749 people were living in the Birmingham City Council ward of Edgbaston and this produced an average of 2.4 people per household, slightly below the city-wide average of 2.5. The ward, which has an area of 871. 6ha, had a density of 23.8 people per hectare. Like the city of Birmingham, Edgbaston had a higher proportion of females, at 50. 1%. 27. 1% of the population was in the 25-44 age bracket and 15. 1% were aged between 45-59, at 14. 8%, Edgbaston had a lower proportion of people of a pensionable age than the rest of Birmingham. It had a proportion of people of working age at 73. 8%. Edgbaston has a slightly above average percentage for ethnic minorities with ethnic minorities representing 31. 8% of the population as opposed to 29. 6% for Birmingham, the largest ethnic minority group was the British Asian group at 16. 1%. 25. 6% of people were born outside of the United Kingdom, christianity was the most predominant religion, with 52. 5% of the population stating that they were Christians, compared with 59. 1% for Birmingham. 8. 0% stated that they were Muslims, below the Birmingham figure of 14. 3%, Edgbaston was home to a significant Orthodox Jewish community. 19. George Roger Waters is an English singer, songwriter and composer. In 1965, he co-founded the progressive rock band Pink Floyd with drummer Nick Mason, keyboardist Rick Wright and guitarist and songwriter Syd Barrett. Waters initially served as the groups bassist, but following the departure of Barrett in 1968, he became their lyricist, conceptual leader. Pink Floyd subsequently achieved success with the concept albums The Dark Side of the Moon, Wish You Were Here, Animals. 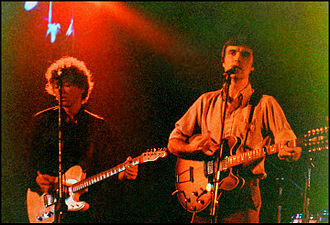 By the early 1980s, they had one of the most critically acclaimed and best-selling acts in the history of popular music, as of 2013. Amid creative differences within the group, Waters left in 1985 and began a dispute with the remaining members over their intended use of the bands name. They settled out of court in 1987, and nearly eighteen years passed before he performed them again. Waters solo career has included three albums, The Pros and Cons of Hitch Hiking, Radio K. A. O. S. In 1990, he staged one of the largest and most extravagant rock concerts in history, The Wall – Live in Berlin, with an official attendance of 200,000. As a member of Pink Floyd, he was inducted into the US Rock and Roll Hall of Fame in 1996 and that same year he released Ça Ira, an opera in three acts translated from Étienne and Nadine Roda-Gils libretto about the French Revolution. Later that year, he reunited with Pink Floyd bandmates Mason and David Gilmour for the Live 8 global awareness event and he has toured extensively as a solo act since 1999 and played The Dark Side of the Moon in its entirety for his world tour of 2006–2008. In 2010, he began The Wall Live and in 2011 Gilmour, as of 2013, the tour is the highest-grossing of all time by a solo artist. George Roger Waters was born on 6 September 1943, the younger of two boys, to Mary and Eric Fletcher Waters, in Great Bookham, Surrey. His father, the son of a miner and Labour Party activist, was a schoolteacher, a devout Christian. 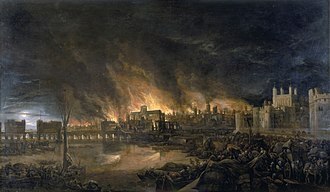 In the early years of the Second World War, his father was a conscientious objector who drove an ambulance during the Blitz. He changed his stance on pacifism, joined the Territorial Army and was commissioned into the 8th Battalion and he was killed five months on 18 February 1944 at Aprilia, during the Battle of Anzio, when Roger was five months old. Michael Mantler is an Austrian composer and trumpeter in new jazz and contemporary music. Mantler was born in Vienna, Austria and he had a personal and professional relationship with Carla Bley, to whom he was married from 1967–1992, and with whom he had a daughter, Karen Mantler, now a musician in her own right. Eventually Bley and he established their own company, WATT — a record label, recording studio and he toured and recorded extensively with the Carla Bley Band as well as occasionally with his own live performance projects. Mantler recorded many albums with varying instrumentation and personnel, emphasizing his work as a composer rather than as a band leader. Appearing infrequently live, he concentrated on composing and recording. Various commissions from and performances with European orchestras followed, including work at Swedish Radio and West German Radio, the Lille Opera, and Danish Radio. His 1987 recording, Many Have No Speech, an album of songs in English and French, was based on the poetry of Samuel Beckett, Ernst Meister, and Philippe Soupault. It was written for orchestra and guitar soloists. In 1991 he left the United States and moved to Europe, new compositions were commissioned by the Danish Radio Big Band and the North German Radio Big Band in Hamburg. During 1992 Mantler recorded a new album, titled Folly Seeing All This, released by ECM Records in March 1993 and its premiere took place at the Copenhagen Jazzhouse in September, followed by a studio production at Denmark Radio. Featured were the voice of Mona Larsen, Mantlers ensemble, the work was subsequently recorded in the studio and released by ECM Records in 1995. The School of Understanding had its première in August 1996 at Arken, participants included singers Jack Bruce, Mona Larsen, Susi Hyldgaard, John Greaves, Don Preston, Karen Mantler, Per Jørgensen, and Robert Wyatt. The recording was released as a double-CD by ECM Records in November 1997 and his One Symphony, commissioned by the broadcaster Hessischer Rundfunk, was premiered in November 1998 by the Radio Symphony Orchestra Frankfurt, conducted by Peter Rundel. Learning to Fly is a song by the English progressive rock band Pink Floyd, written by David Gilmour, Anthony Moore, Bob Ezrin, and Jon Carin. It was the first single from the thirteenth studio album A Momentary Lapse of Reason. Meanwhile, the failed to chart on the official U. K. top 40 singles charts. The song was written by David Gilmour, who developed the music from a 1986 demo by Jon Carin. The notable rhythm pattern at the beginning of the song was present in the demo. 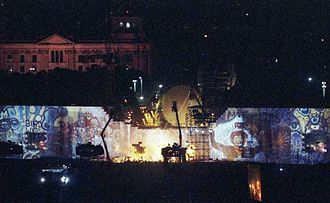 Gilmour confirmed the interpretation on the Pink Floyd 25th Anniversary Special in May 1992. Also an avid pilot, drummer Nick Masons voice can be heard at around the middle of the song, Learning to Fly was included on Pink Floyds greatest hits collection Echoes, The Best of Pink Floyd. The track was performed live on the bands two post-Roger Waters tours, with touring guitarist Tim Renwick playing the songs guitar solos. A live version is included on Delicate Sound of Thunder and Pulse, at the end of the final solo in both versions, a guitar lick from the second verse of Young Lust is played. The Hall School is an independent boys preparatory school in Belsize Park, London, currently teaching boys from age 4 to age 13. The school, across its three buildings, has a roll of over 450 boys, approximately 50 in each Year from Years 1-8 and 32 in Reception. Reception to Year 3 are based in the Junior School, Year 4 and 5 in the Middle School, the school operates a house system of four houses, Green and Purple. These are used throughout the school for academic and musical competitions, the school is known for its pink uniform consisting for many years of a pink school blazer and tie. Alumni will recognise the schoolboy terrorizing, recalled by food critic, the school originated as Belsize School, founded in 1889 by the Revd Francis John Wrottesley, who with his wife had taken fee-paying pupils at their home in nearby 18 Buckland Crescent since 1881. The Wrottesleys sold their school in 1898 to the Revd D. H. Marshall, who took over a house in 1903. In 1905 Marshall bought the Allen Olney girls school, which his wife continued at Buckland Crescent, Marshall moved the boys to Crossfield Road and renamed the school The Hall. The Mellotron is an electro-mechanical, polyphonic tape replay keyboard originally developed and built in Birmingham, England, in 1963. 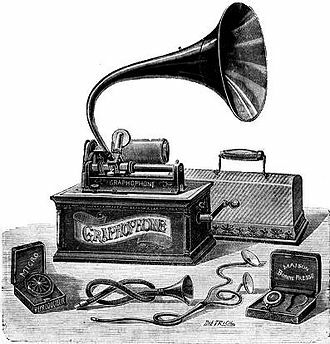 It evolved from an instrument, the Chamberlin, but could be mass-produced more effectively. 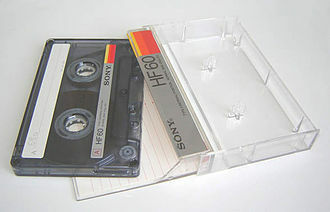 The instrument works by pulling a section of magnetic tape across a head, different portions of the tape can be played to access different sounds. The original models were designed to be used in the home, bandleader Eric Robinson and television personality David Nixon were heavily involved in the instruments original publicity. A number of celebrities such as Princess Margaret were early adopters. The Mellotron became more popular after the Beatles used it on several tracks and it was subsequently adopted by the Moody Blues, King Crimson and Genesis, and became a notable instrument in progressive rock. 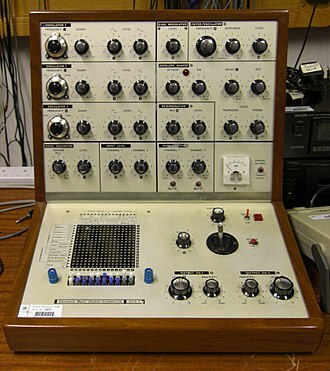 Later models such as the M400, the best selling model, dispensed with the accompaniments, the instrument became less popular in the 1980s due to the introduction of polyphonic synthesizers and samplers, despite a number of high profile uses from Orchestral Manoeuvres in the Dark and XTC. Production of the Mellotron ceased in 1986, but it regained popularity in the 1990s and this led to the resurrection of the original manufacturer, Streetly Electronics. In 2007, Streetly produced the M4000, which combined the layout of the M400 with the selection of earlier models. The Mellotron has a similar behaviour to a sampler, but generates its sound via audio tape, when a key is pressed, a tape connected to it is pushed against a playback head, like a tape recorder. While the key remains depressed, the tape is drawn over the head, when the key is released, a spring pulls the tape back to its original position. A variety of sounds are available on the instrument, on earlier models, the instrument is split into lead and rhythm sections. There is a choice of six stations of rhythm sounds, each containing three tracks and three fill tracks. The fill tracks can be mixed together, there is a choice of six lead stations, each containing three lead instruments which can be mixed. In the centre of the Mellotron, there is a button that allows a variation in both pitch and tempo. Capitol Records, LLC is an American record label which operates as a division of the Capitol Music Group. The label was founded as the first West Coast-based record label in the United States in 1942 by three industry insiders named Johnny Mercer, Buddy DeSylva and Glenn Wallichs, in 1955, the label was acquired by the British music conglomerate EMI as its North American subsidiary. EMI was acquired by Universal Music Group in 2012 and was merged with the company in 2013, making Capitol Records, Capitol Records circular headquarter building located in Los Angeles is a recognized landmark of California. Mercer first raised the idea of starting a company while golfing with Harold Arlen. By 1941, Mercer was a songwriter and a singer with multiple successful releases. Mercer next suggested the idea to Wallichs while visiting his record store, Wallichs expressed interest in the idea and the pair negotiated an agreement whereby Mercer would run the company and identify their artists, while Wallichs managed the business side. On February 2,1942, Mercer and Wallichs met with DeSylva at a Hollywood restaurant to inquire about the possibility of investment of the company from Paramount Pictures, while DeSylva declined the proposal, he handed the pair a check worth $15,000. On March 27,1942, the three men incorporated as Liberty Records, in May 1942, the application was amended to change the companys name to Capitol Records. On April 6,1942, Mercer supervised Capitols first recording session where Martha Tilton recorded the song Moon Dreams, on May 5, Bobby Sherwood and his orchestra recorded two tracks in the studio. On May 21, Freddie Slack and his orchestra recorded three tracks in the studio, one with the orchestra, one with Ella Mae Morse called Cow-Cow Boogie, on June 4,1942, Capitol opened its first office in a second-floor room south of Sunset Boulevard. On that same day, Wallichs presented the companys first free record to Los Angeles disc jockey Peter Potter, on June 5,1942, Paul Whiteman and his Orchestra recorded four songs at the studio. One of These Days is the opening track from Pink Floyds 1971 album Meddle. The composition is instrumental except for a line from drummer Nick Mason. It features double-tracked bass guitars played by David Gilmour and Roger Waters, with each bass hard panned into one channel of stereo, but one bass sound is quite muted and dull. According to Gilmour, this is because that particular instrument had old strings on it, the predominant element of the piece is that of a bass guitar played through a delay unit, set to produce repeats in quarter-note triplets. The result of setting is, if the player plays simple quarter notes. Pink Floyd would again use this technique on the line for Sheep. The piece is in B minor, occasionally alternating with an A major chord, for live versions, the fade in part was played on a Farfisa organ. The threatening lyric, a vocal contribution by Nick Mason, was recorded through a ring modulator. It was aimed at Sir Jimmy Young, the BBC Radio 1, during early 1970s concerts, they sometimes played a sound collage of clips from Youngs radio show that was edited to sound completely nonsensical, thus figuratively cutting him into little pieces. The bootleg compilation A Treeful of Secrets contains a version of One of These Days in which the Jimmy Young collage loops in the background during the performance. However, the authenticity of this demo has not been confirmed, possibly the most interesting thing about One of These Days is that it actually stars myself as vocalist, for the first time on any of our records that actually got to the public. Its a rather startling performance involving the use of a high voice, according to John Peel, Waters has described One of These Days as a poignant appraisal of the contemporary social situation. Gilmour has stated that he considers it the most collaborative piece ever produced by the group, a film, French Windows, was made by Ian Emes, set to the piece and featuring people and gibbons dancing against various backgrounds. 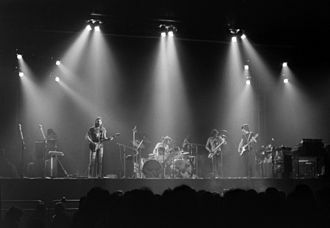 After being seen on television by the band, it was back-projected by Pink Floyd during live performances and Emes was commissioned to make films for the band. It has since released as an extra on the bands Pulse DVD. Pink Floyd in January 1968, one of the only known photoshoots of all five members. Clockwise from bottom: Gilmour, Mason, Barrett, Waters and Wright. 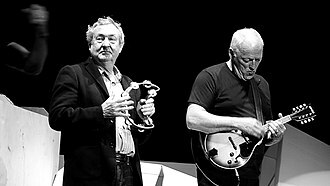 Gilmour with drummer Nick Mason (left) at The O2, London, during The Wall Live, 12 May 2011. Roger Waters and band play Pink Floyd's "Set the Controls for the Heart of the Sun"
The original LP gatefold includes, for the first time since 1971's Meddle, an image of the band. Wright appears only by name in the credits.